Two days after Thanksgiving I hit a wall. I woke up in the morning, fed the dogs and went straight back to bed. Slept another hour and a half, then got up for an hour. After that I did manage to finish a 1500 word article and write one whopping paragraph in my new book, but other than that, I pretty much laid around. I felt like a slug. Truth be told, I knew this day was coming. I cooked most of Thanksgiving dinner myself, for the first time in five years. In addition, we had friends come visit the day after Thanksgiving. It was so nice to catch up with them and do "normal" stuff like driving through the Festival of Lights and going out to dinner. The problem was, I didn't have enough spoons for all that activity. Too impatient? I knew it. Okay, I'll give you the condensed version. Imagine you have ten spoons. 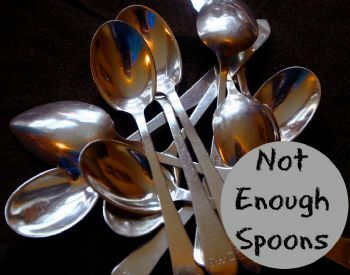 Every day you have no more than ten spoons. If you're me, working, socializing, cooking, not to mention any particularly emotional events or surprises (dog threw up, son is sick, etc.) all use up spoons. So you have to decide what things are spoon-worthy (or spoon-necessary) in any given day. On rare occasions you can borrow from the next day's spoons, but if you do this too often, you'll wake up one day unable to get out of bed. Obviously I used way too many spoons between Thursday and Friday. When I overdo it, it can either result in exhaustion or a meltdown or both. Fortunately, this time it was just exhaustion, but obviously I need to re-evaluate, with Christmas approaching, and remind myself not to overdo it around the holidays. I have never heard of the spoon theory but I like it a lot. I can totally relate when I think back to my years of child raising, work and.... Time flew by and I am retired. It is much easier to keep track of them now. Take care of yourself and keep count of those spoons so you can use them for what is really important. I really like the spoon theory. Take care. I'm going to count my spoons today! Nice idea. A very good way to educate folks!